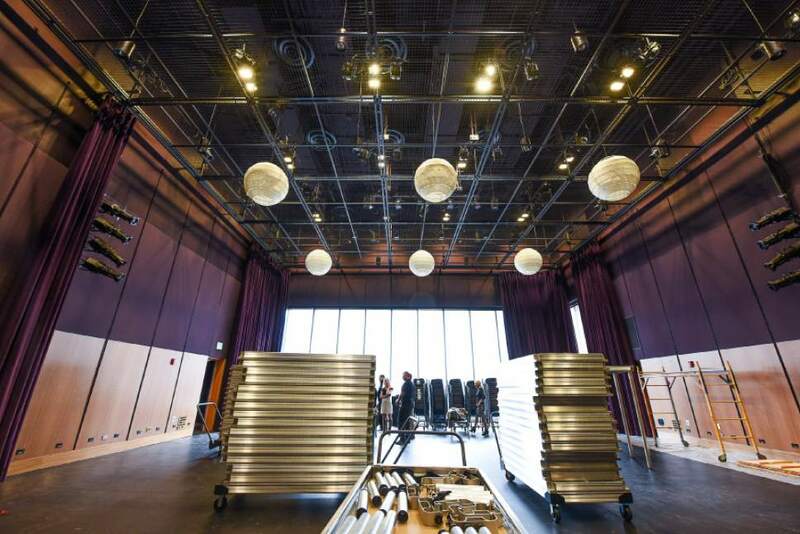 Opening of a downtown arts complex draws the curtain on a new act in Salt Lake City's love affair with stage productions. 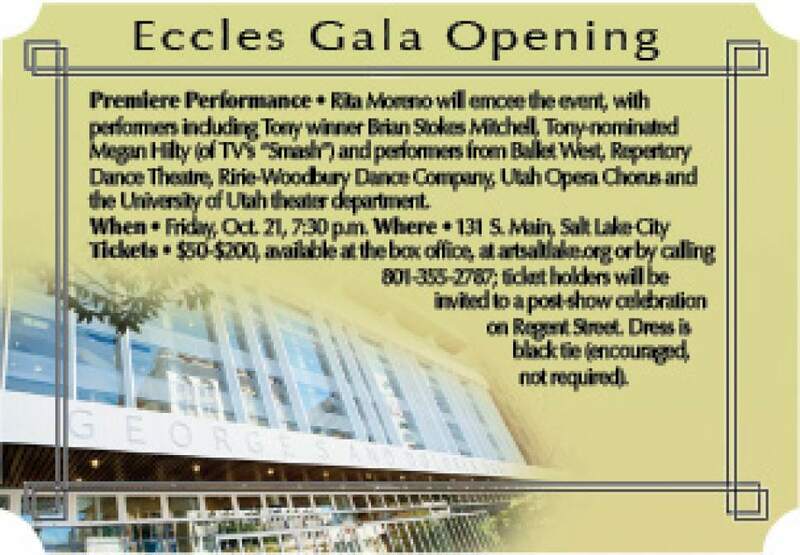 Francisco Kjolseth | The Salt Lake Tribune The new Eccles theater in downtown Salt Lake City prior to opening day. 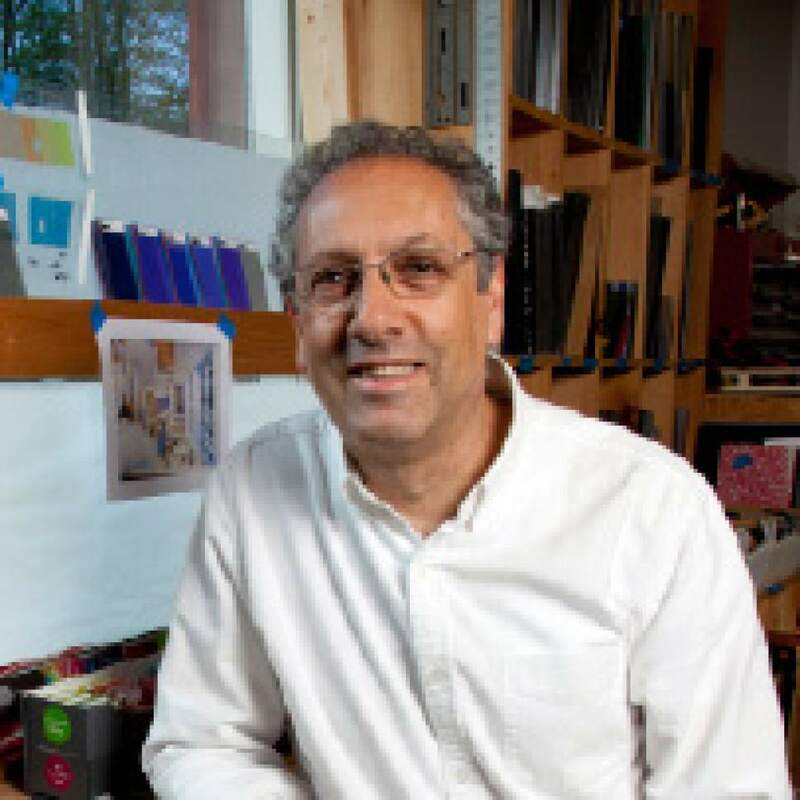 Glass artist Paul Housberg, who created the public art in the lobby of the Eccles Theater. Scott Lapham | Courtesy Courtesy photo Utah-based artist Laura Sharp Wilson, who created the floor of the Eccles Theater lobby. 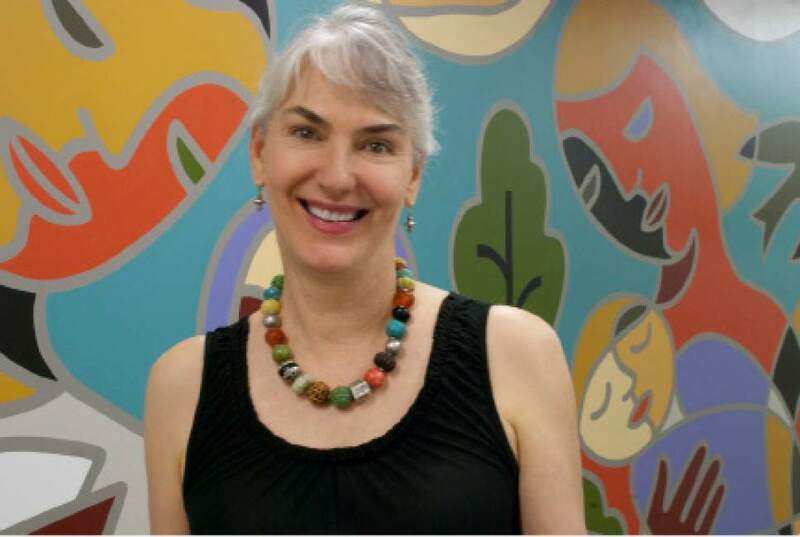 Courtesy photo Mural for the locking dock door of the Eccles Theater by Utah-based artist Traci O'Very Covey. Courtesy photo Utah-based artist Traci O'Very Covey. Rick Egan | The Salt Lake Tribune Acoustics consultant Mark Holden talks about the effort and research that went into the state-of-the-art George S. and Dolores Doré Eccles Theater, opening Oct. 21 in downtown Salt Lake City. 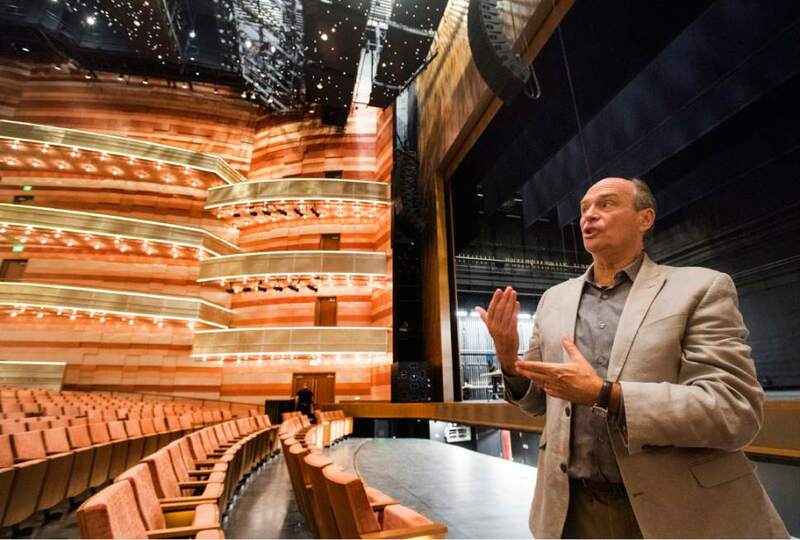 Rick Egan | The Salt Lake Tribune Acoustics consultant Mark Holden talks about the effort and research that went into the state-of-the-art George S. and Dolores Doré Eccles Theater, opening Oct. 21 in downtown Salt Lake City. 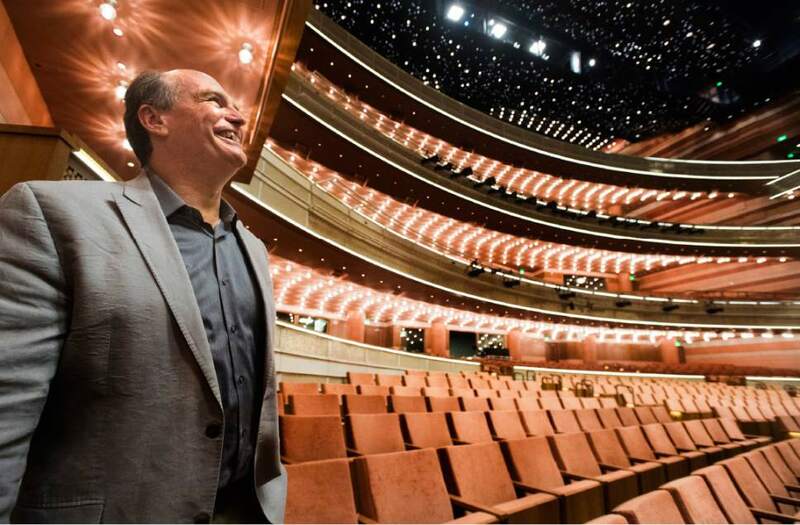 Rick Egan | The Salt Lake Tribune Acoustics consultant Mark Holden talks about the effort and research that went into the state-of-the-art George S. and Dolores Doré Eccles Theater, opening Oct. 21 in downtown Salt Lake City. 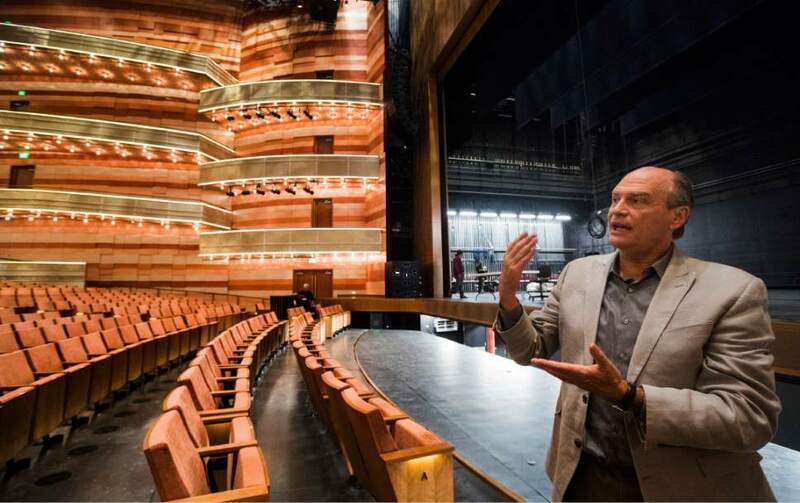 Rick Egan | The Salt Lake Tribune Acoustics consultant Mark Holden talks about the effort and research that went into the state-of-the-art George S. and Dolores Doré Eccles Theater, opening Oct. 21 in downtown Salt Lake City. Rick Egan | The Salt Lake Tribune Acoustics consultant Mark Holden talks about the effort and research that went into the state-of-the-art George S. and Dolores Doré Eccles Theater, opening Oct. 21 in downtown Salt Lake City. 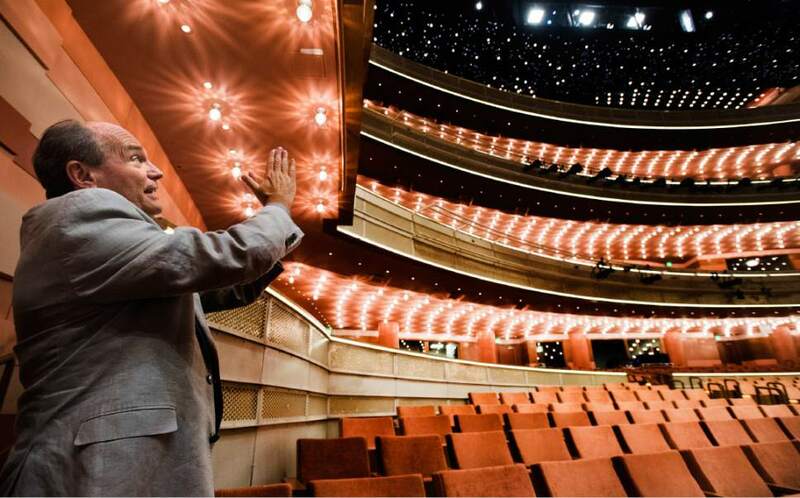 Rick Egan | The Salt Lake Tribune Acoustics consultant Mark Holden talks about the effort and research that went into the state-of-the-art George S. and Dolores Doré Eccles Theater, opening Oct. 21 in downtown Salt Lake City. 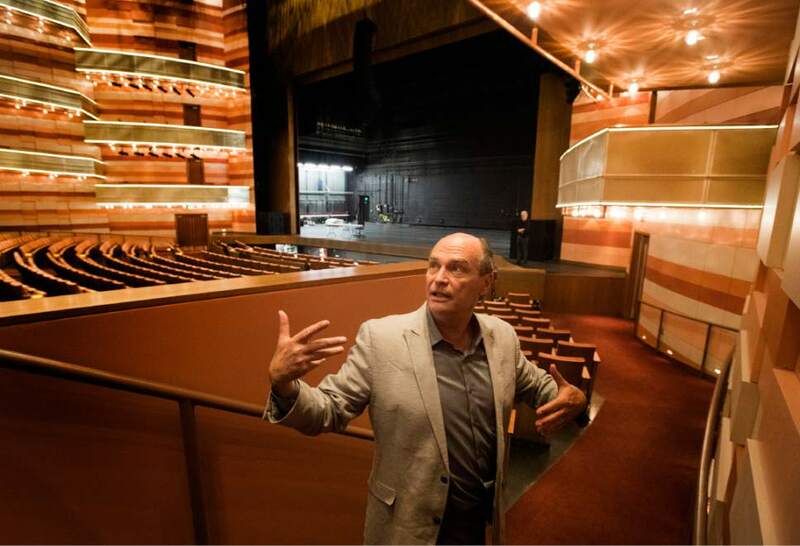 Rick Egan | The Salt Lake Tribune Acoustics consultant Mark Holden talks about the effort and research that went into the state-of-the-art George S. and Dolores Doré Eccles Theater, opening Oct. 21 in downtown Salt Lake City. In the ongoing saga of Salt Lake City&apos;s historic love affair with theater, now comes the big reveal of a second act: the debut of Main Street&apos;s George S. and Dolores Doré Eccles Theater. After years in the planning stages, next weekend&apos;s grand opening gala will inaugurate the $119 million addition to downtown&apos;s cultural core. It&apos;s the second of three major theater openings in Utah planned this year, a building boom that&apos;s unprecedented in the country, say national industry officials. 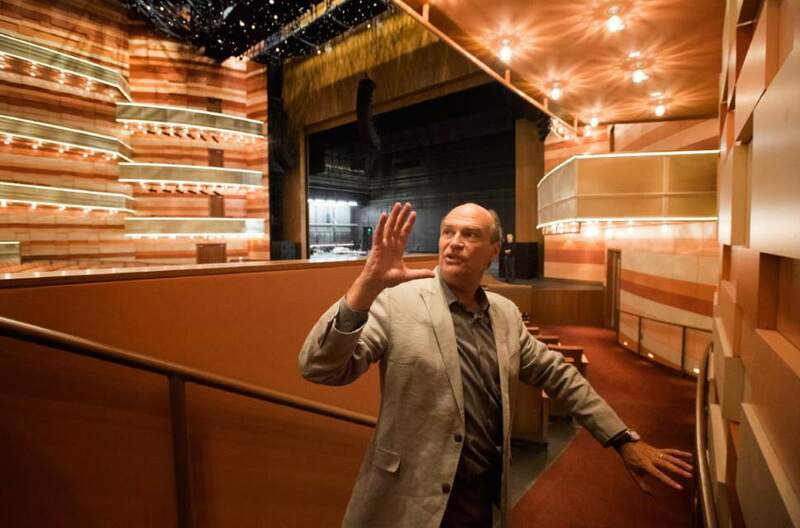 The Eccles Theater, jointly owned by the city and county and a longtime urban priority for former Salt Lake City Mayor Ralph Becker, is "purpose built" as a roadhouse for touring Broadway musicals, concerts and other theatrical performances. It joins the Capitol Theatre, a historic vaudeville house, one block to the west, which was renovated to serve as the home for Ballet West and Utah Opera. Also in the downtown cultural portfolio are the Utah Symphony&apos;s Abravanel Hall, two blocks northwest, and the Rose Wagner Performing Arts Center, two blocks to the southwest, home to six dance, theater and music nonprofit arts companies. 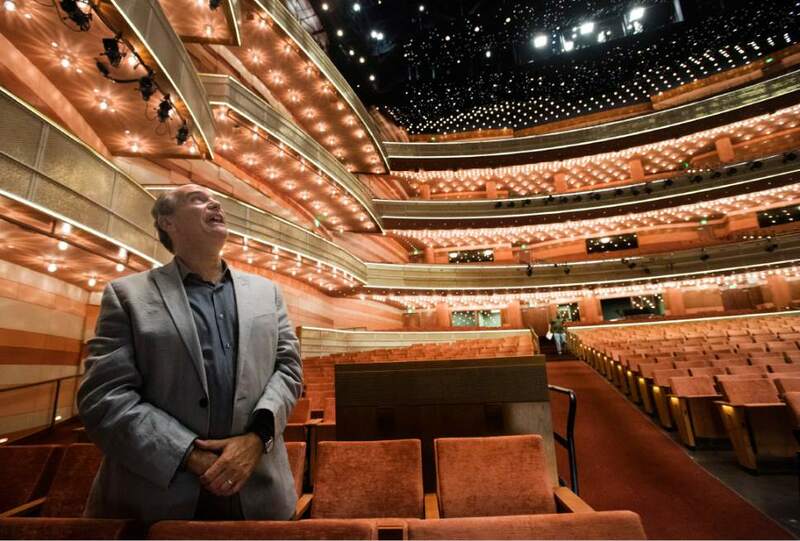 An intimate space with nearly 2,500 seats • Opening the Eccles Theater is part of a years-long goal to create "the right-size venue for the right-size work," says Phil Jordan, director of Salt Lake County&apos;s Center for the Arts, which will operate the complex, as well as the three other downtown cultural venues. "There&apos;s not a bad seat in the house, in my opinion. This is as best an intimate setting that you can have with 2,486 chairs." Designed by Connecticut-based Pelli Clarke Pelli Architects in conjunction with the local office of HKS Architects, the theater features a soaring, light-flooded lobby six stories high, which includes public art projects in the colorful glass balconies and a marble-and-glass terrazzo floor. The lobby&apos;s entrances are walls of glass curtains that can open onto Main Street to create a space termed the Winter Garden. The desire for a generous lobby space meant the theater was "squished" or built upward, with three balconies above the orchestra level. Those balconies contribute to what&apos;s a relatively short distance  98 feet  from the stage to the back wall, compared with a 106-foot distance at the Capitol Theatre. The copper- and rust-colored furnishings in the main Delta Performance Hall are meant to evoke the striated sandstone layers in southern Utah. One of the hall&apos;s most visually prominent design elements is the ceiling&apos;s star field, reminiscent of the state&apos;s wide-open night skies, even if the lighting patterns are "nonastronomically correct," says Jeff Gwilliam, the county&apos;s theater operations manager. What&apos;s Neil deGrasse Tyson going to say about that? That&apos;s one of the joking questions Gwilliam has heard while taking people on tours of the facility, referring to the astrophysicist&apos;s upcoming February lecture at the theater. The star field, which incorporates larger globes to represent planets, serves as a creative, yet relatively inexpensive way to dress the ceiling, while also providing a variety of lighting effects that producers could incorporate into shows. It&apos;s coupled with dramatic acrylic globe lights underneath the balconies. "The lighting in this facility," Gwilliam says, "is very much an architectural design." Arts in Zion • In the arts nonprofit world, producers cheer the completion of the spectacular complex at the same time they worry about competition for ticket sales, particularly in the holiday season. "What I hope it will do is invigorate more people to go to live performances all the time," says R. Scott Phillips, retiring executive director at Cedar City&apos;s Utah Shakespeare Festival, which opened two new theaters in the $39 million Beverley Taylor Sorenson Center for the Arts this summer. Yet, he cautions, Utah arts groups haven&apos;t completely recovered from the Great Recession. "This is the new normal, but it&apos;s not the normal it was eight years ago. We&apos;re all trying to figure out what that is and how do we work within that, at least for the foreseeable future." The county is partnering with for-profit companies to program the new venue, including MagicSpace Entertainment for the Broadway at the Eccles series and concert promoters Darin Piccoli and Chris Mautz for the Live at the Eccles series. "Anytime you have a major new player come on the scene, you&apos;re essentially slicing the pie in a greater number of slices," says Chris Lino, managing director at Pioneer Theatre Company, the 55-year-old professional theater based at the University of Utah. 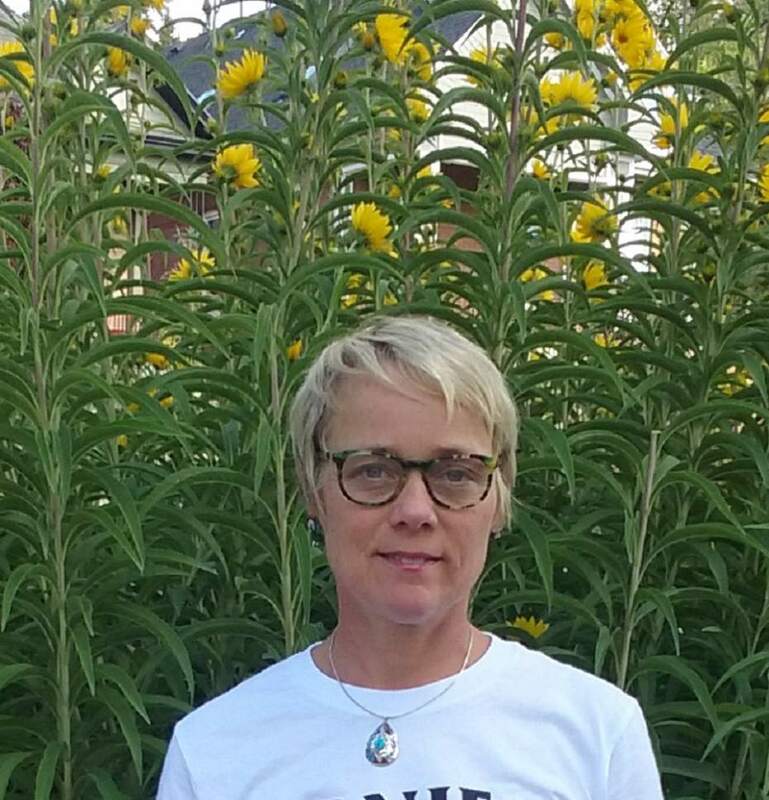 "The size of the slice existing organizations have had will get a little smaller. This is a community that has shown an appetite for attending arts events. However, divided into as many pieces as it is now, that&apos;s not to say the audience for performing arts events is growing." Spilling into the street • One of the building&apos;s most innovative features is its multiuse lobby, outfitted with lighting and electrical rigging so it can be used for performances, with audiences spilling outside onto the front stairs and sidewalk. "So the lobby becomes the street, and the street becomes the lobby," explains HKS project manager Emir Tursic, underscoring the city&apos;s aim for the venue to help revitalize the downtown block. Designers hope the theater&apos;s "diminishing steps" fronting the building will serve as a gathering place for pedestrians or lunch crowds. The steps were designed for the block&apos;s southward slope, ranging from a single step at the main entrance to eight steps at the south end. "That&apos;s another way to engage the street," Tursic says. And speaking of multiuse, the complex includes the Regent Street Black Box Theater  which is decorated in deep purple furnishings. The smaller theater features 16-foot-high windows overlooking the midblock street, which once housed newspaper printing presses and now hosts the venue&apos;s state-of-the-art loading docks. Another unexpected public space in the complex is the fourth-floor covered Main Street Terrace, which provides street views and nods to the city&apos;s other rooftop gardens  at The Church of Jesus Christ of Latter-day Saints&apos; Conference Center and the city&apos;s Main Library. The center also includes the Galleria, a covered west-east corridor linking Main and Regent streets, lined with display cases to advertise upcoming shows, which will also allow fans to access the performers&apos; stage door. While that&apos;s common for Broadway theaters, Jordan says, it&apos;s rarer among the country&apos;s roadhouses. The block&apos;s slope also was utilized to provide easier access for theatergoers in wheelchairs from the theater&apos;s northwest corner. "It&apos;s pretty much unheard of that a disabled patron can roll in off the street to their seat," Jordan says. Speaking of site elevation, there&apos;s this: The Regent Street loading docks to the southeast are level with the stage, which will eliminate the stagehands&apos; complicated gymnastics of unloading boxes down an 11-foot ramp at the Capitol Theatre, after trucks were threaded backward through the parking structure off 200 South. "From my perspective, it marks the growth of Salt Lake City, no longer just having streets and buildings facing one side," Jordan says. "It shows the complexity of uses of the downtown core, for the building to have multiple doors. It&apos;s a great reuse of the property." An urban building • Every surface in the theater&apos;s main hall was part of the acoustic design, aiming in part to mitigate the noise of downtown streets and the TRAX trains right outside the theater&apos;s front door, says Mark Holden, of Connecticut-based JaffeHolden Acoustics. The theater was built on top of extra concrete  about 5 feet deep underneath the lobby, for example  to dampen vibrations from the trains. From the lobby, solid wooden doors lead to a sound-absorption zone that funnels into the theater. Even the cracks in the hall&apos;s surface paneling  which step out 2, 3 and 4 inches  were planned to diffuse sound waves and create a smoother or mellow sound, especially at higher frequencies, says Holden, who has been consulting on the theater&apos;s acoustic plan for eight years, from concept to modeling to building design. Most theatergoers will never see the motorized series of 6,000 square feet of fireproof black velour drapes in the hall&apos;s attic, which provide "a full-frequency sound when deployed," Holden says. As Gwilliam says: "It&apos;s the same technology they used in castles to control noise in corridors as well as blocking cold from coming in. It&apos;s the most cost-effective way of doing it." The theater&apos;s sound system is top-of-the-line, so current that it wasn&apos;t yet invented when project bids went out three years ago. "This system makes me want to get out the Q-tips, clear out my ears and start driving a soundboard again," Gwilliam says. All of the building&apos;s heating and air-conditioning systems are tucked away on the roof, "cleverly designed to break all the rules," Holden says. "At full blast, you can&apos;t hear them." The theater&apos;s orchestra pit can be expanded to fit 95 musicians, nearly the size of the Metropolitan Opera&apos;s pit. And there&apos;s rigging installed in front of the hall&apos;s proscenium stage, which means that larger shows&apos; set pieces won&apos;t need to be nailed into the ceiling  as they have been at Capitol Theatre. Overall, planners say the project is a masterful example of collaboration. Many design ideas grew out of brainstorming meetings with city and county officials, artists and theatergoers. It took more than a village to build the Eccles Theater, Tursic says, acknowledging city, county, arts groups, construction and LDS Church participation. "Hopefully," he says, "everybody can be proud of it." Premier Performance • Rita Moreno will emcee the event, with performers including Tony winner Brian Stokes Mitchell, Tony-nominated Megan Hilty (of TV&apos;s "Smash") and performers from Ballet West, Repertory Dance Theatre, Ririe-Woodbury Dance Company, Utah Opera Chorus and the University of Utah theater department.